The dollar stormed the board, with the euro and the pound standing out as the biggest losers. The Fed decision is the key event in a week that also features rate decision in Japan and Switzerland, employment data from the UK and the US and many more. 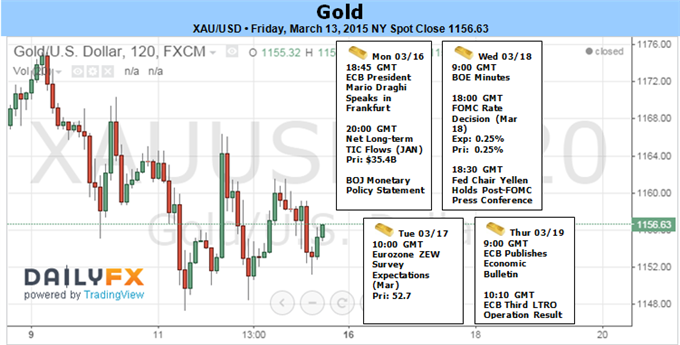 These are the major events on FX calendar. Join us as we check on the highlights of this week. Mario Draghi Speaks: Monday, 18:45.ECB President Mario Draghi is scheduled to speak in Frankfurt. He may talk to the ECB’s new QE plan aimed to spur growth in the euro member countries by injecting 1.1 trillion euros ($1.2 trillion) into the economy. Market volatility is expected. In his previous speech, Draghi hurt the euro: he reiterated that reaching the stronger growth forecasts depends on implementation of current programs. Japan rate decision: Tuesday. The Bank of Japan (BoJ) voted to maintain its monetary policy in its February meeting and continue implementing its plan to increase monetary base to an annual pace of JPY 80 trillion. This step will help ensure the Central Bank’s inflation target of 2.0%. 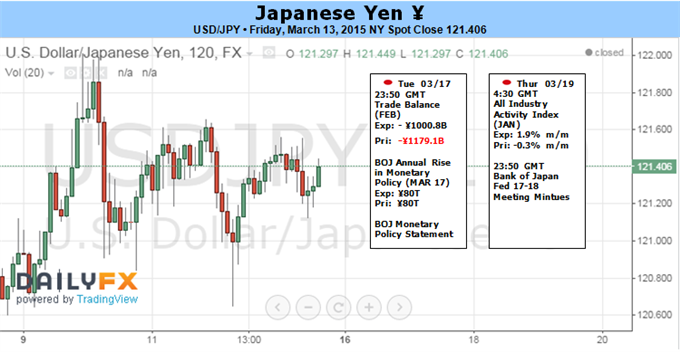 The BOJ noted the economy continued its moderate recovery with a pickup in exports. Consumer spending also remained strong due to rising employment and better wages. Inflation expectations remain positive despite the decline in oil prices. Rates are expected to remain unchanged this time. German ZEW Economic Sentiment: Tuesday, 10:00. German analyst and investor sentimentjumped in February its highest level in a year, reaching 53, following 48.4 in January boosted by the European Central Bank’s bond-buying program. However, the Greek debt problem and the Ukraine crisis weighed on the economic outlook. Economists expected a higher leap to 55. The German government forecasts growth of 1.5% in 2015. Sentiment among German analysts and investors is forecasted to improve to 58.9 in March. US Building Permits: Tuesday, 12:30. Building Permits weakened further in January reaching 1.053 million, dropping 0.7% form the rate of 1.07 posted in December. Economists expected a rise to 1.08 million. Other housing figures were also disappointing such as a 2% decline in housing starts and low homebuilder sentiment. Housing recovery remains slow and prices outpace wage growth. The number of permits is expected to grow to1.07 million. UK employment data: Wednesday, 9:30. Britain’s labor market continued to improve in Januarywith a bigger than expected decline in the number of jobless applications. The number of unemployed declined by 38,600 in January after a 35,800 drop in December, indicating job creation is rising. Economists expected a smaller decline of 25,200 in January. According to the ILO measure, unemployment fell by 97,000 in the three months to December, lowering the unemployment rate to 5.7%. Another decline of 31,000 is expected in the number of jobless applications. US rate decision: Wednesday, 18:00, press conference at 18:30. The Federal Reserve maintained their monetary policy in January, leaving the door open for a rate hike around June 2015, after more than six years of near zero rates. The Fed admitted that inflation weakened considerably due to the recent drop in oil prices. The members are watching for economic developments to see what happens. Job gains continue to grow and the unemployment rate has also declined closing in on its prerecession level, however, wage growth remains subdued as companies continue to find an abundant supply of potential employees. The rate is expected to remain at 0.25%. NZ GDP: Wednesday, 21:45. New Zealand economy boosted growth in the third quarter expanding 1.0%, the strongest gain in 15 years. This impressive figure was preceded by a 0.7% expansion in the second quarter. Economists expected a growth rate of 0.7%. On a yearly base, growth remained unchanged from the second quarter reaching 3.2%. New Zealand is expected to expand by 0.8% in the fourth quarter of 2014. Switzerland rate decision: Thursday, 8:30. The Swiss National Bank rocked markets on January, while deciding to abandon its three-year-old currency cap of 1.20 Swiss francs to the euro, sending the currency high against the euro sending stocks down. Being an export reliant, 40% of which going to the euro zone endangered many Swiss companies. To balance the Swiss franc, the SNB cut its interest rate taking it further down into negative territory of -0.75% following -0.25% in the previous month. No change in rates is expected. US Unemployment Claims: Thursday, 12:30. The number of Americans filing initial claims for unemployment benefits declined more than expected last week, reaching 289,000. The 36,000 fall offers further evidence that the labor market is strengthening. Economists expected a higher figure of 306,000. The four-week moving average fell 3,750 to 302,250 last week. The NFP report showed a 295,000 job gain in February and a 6-1/2-year low of 5.5% unemployment rate. February marked the 12th straight month that employment gains have been above 200,000, the longest such run since 1994. The number of new claims for unemployment benefits is predicted to rise to 297,000 this week. US Philly Fed Manufacturing Index: Thursday, 14:00. Manufacturing activity in the Philadelphia area fell to 5.2 in February, following 6.3 in January, while economists expected a rise to 8.8. However, despite the three months of decline, manufacturing activity still remains positive pointing to growth. The outlook showed 55% of companies were optimistic regarding future demand, while 20% reported a decline. Economists believe the Philly Fed is affected by seasonal adjustment factors in winter and in fall. Expecting a boost in the spring and summer seasons. Manufacturing activity is expected to7.3 in March. The day of reckoning is almost upon us. This Wednesday, the Federal Open Market Committee (FOMC) will deliver its forecasts for economic trends and interest rates. These projections are neither promises for action nor a commitment to a rigid time frame. In isolation, they may not have much sway over the Dollar or capital markets. However, context is everything. For the past six-years, stimulus has been a ubiquitous feature of the market and many believe the backbone to the exceptional exposure the markets have taken on. There is certainly big picture influence in this event. Then again, it also possess a short-term volatility risk – particularly for the Dollar – as a recent surge in speculative anxiety has focused the world’s attention. There are eight FOMC policy meetings a year and those that fall on the standard quarters come with updated forecasts from the Committee’s members as well as a press conference from the Chairperson. The March 18 meeting falls on the quarter and will deliver updated predictions for employment, inflation and interest rates along with a closely dissected statement. There are a few things to watch in this particular event. For the focus the media has shaped, the top concern will be with the use of the word ‘patience’. Given that a central bank cannot commit to policy ahead of time – data could change between their vow and the time of action – the market looks to interpret their intentions through carefully crafted remarks. Language was important for assessing the lead up to QE2 and QE3, the end of QE3 and now the shift towards the first rate hike. After the central bank capped its open-ended stimulus program, the emphasis was placed on the suggestion that rates would be held at an “exceptionally low” level for an “extended period”. Through off-handed central bank remarks, the inclusion of this phraseology in a statement was interpreted to mean the benchmark would be held near zero for at least another six months. This was abandoned at the end of last year. Now, the focus is on “extended period”s replacement: “patient”. This particular adjective has been assigned a three-month time span which – if it is dropped at this week’s meeting – would tip a June 17 rate hike. The question that Dollar traders should be asking is how significant the impact a change or maintenance of the language will be. Given the currency’s record-breaking, eight consecutive month rally and the aggressive 7 percent rally these past few weeks (on the ICE Dollar Index); it would seem that the benchmark is set high. That said, there is certainly room for the bulls to carry on. While a June time frame seems the consensus amongst economists, Fed Fund futures are still pricing in the first move out to the October 28 meeting. There is market adjustment that can be made. Looking beyond the excitement of timing the first rate hike for driving a pair like EURUSD down to parity, it is worth considering the bigger picture. Even if the first hike is realized in three months’ time, it is only a move off the zero bound. Moving forward, the pace of subsequent policy tightening becomes increasingly important. However, if the US does engage in a rate hike regime; it will increasingly contrast to major central banks (ECB, BoJ, PBoC) that are still exploring greater stimulus programs. So even if the FOMC downgrades its average December 2015 rate forecast from its 1.125 percent forecast at the December meeting, context is important. For FX traders, the focus of the upcoming event risk is easily on the rates-Dollar connection. Yet, investors in any asset should take note of this event for its influence speculative appetite. A ‘yield chase’ has developed out of years of excessive monetary policy coupled with a moderate recovery. And, while the Fed’s own contribution to the system can notionally be replaced by the growing stimulus in Europe and Asia, risk aversion can still spread by the Fed’s shift. Given the dependency on low cost capital (chased with leverage) and the easy of contagion transmission across the global financial system (remember the Great Financial Crisis began in US housing), sentiment is on the edge of an inflated balloon. It also happens that the Dollar represents liquidity in a fire sale market. 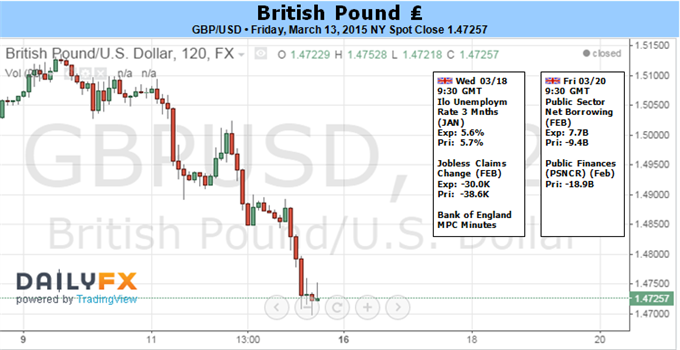 British Pound Volatility Near-Guaranteed – Which Way Will it Break? The British Pound tumbled to fresh five-year lows versus the high-flying US Dollar as traders repriced UK interest rate prospectives. Can a key Bank of England MPC Minutes report boost the Sterling ahead of a critical US Federal Reserve interest rate decision? A potentially pivotal week ahead points to major volatility across GBP pairs, and whether or not domestic yields can recover versus the USD equivalents will likely determine direction in the GBPUSD. The fact that the Sterling actually trades near 8-year highs versus the Euro (EURGBP lows) helps explain the significance of interest rate differentials. Traders have sent the Euro to major lows across the board as the European Central Bank cuts interest rates into negative territory, while the Sterling remains a relative outperformer as a higher-yielding European alternative. Will Bank of England MPC Minutes boost expectations for the future of domestic interest rates? As it stands, interest rate derivatives currently predict that the BoE and the US Fed will be the only two G10 central banks to raise interest rates in the coming 12 months. Yet the Sterling has fallen significantly versus the US Dollar as BoE Governor Mark Carney dampened speculation that rate hikes were imminent. Carney highlighted GBP appreciation (versus the Euro) as a key reason to keep interest rates lower for longer. It seems like a paradox: the GBP remains strong because of beneficial interest rate expectations, but currency strength itself makes those same rate hikes less likely. Short-term forecasts for the Sterling seem especially uncertain ahed of the release of Bank of England MPC Meeting Minutes and a highly-anticipated US Federal Open Market Committee meeting. FX options traders have sent 1-week and 1-month GBPUSD volatility prices/expectations to their highest since the Scottish Referendum. And with uncertainly surrounding upcoming UK Government Elections, traders may prove especially skittish on any surprises. It’s shaping up to be a make-or-break week for the Sterling—can the Bank of England force it higher versus the high-flyinig USD? The Federal Open Market Committee’s (FOMC) March 18 meeting may overshadow the fresh commentary coming out of the Bank of Japan (BoJ) and heavily influence the near-term outlook for USD/JPY as Chair Janet Yellen and Co. are widely anticipated to remove the ‘patience’ language from the forward-guidance for monetary policy. The Fed may implement a more hawkish twist to the forward-guidance and show a greater willingness to normalize monetary policy in mid-2015 as the central bank remains upbeat on the economy. Indeed, the 295K expansion in Non-Farm Payrolls along with the 5.5% unemployment rate may raise the Fed’s scope to raise the benchmark interest rate in June especially as the figure approaches the ‘natural rate of unemployment.’ However, the ongoing slowdown in retail/discretionary spending may becoming a growing concern for the central bank as lower energy costs largely fail to boost private-sector consumption, one of the leading drivers of growth. With that said, the updated economic projections coming out of the central bank may reflect a slower trajectory for the normalization cycle as the Fed continues to combat the disinflation environment. In contrast, the BoJ interest rate decision may have a limited impact on the USD/JPY should we may get more of the same from Governor Haruhiko Kuroda. The central bank head may continue to endorse a wait-and-see approach as he remains confident in achieving the 2% target for inflation over the policy horizon, and market participants may end up turning a blind-eye to the event as we approach the end of Japan’s 2014 fiscal year. With that said, the long-term outlook for USD/JPY remains bullish as the FOMC remains well on its way to remove the zero-interest rate policy (ZIRP), but the fresh development coming out of the central bank is likely to heavily impact near-term volatility in as market participants continue to speculate on the timing and the pace of the Fed’s normalization cycle. 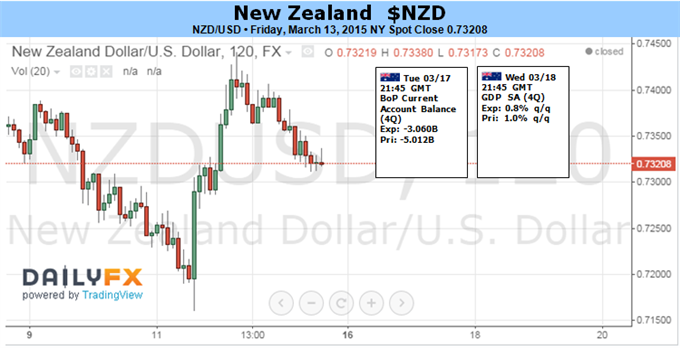 The New Zealand Dollar managed to find support against its US counterpart after the RBNZ signaled it was in no hurry to cut interest rates at its monetary policy meeting. Governor Graeme Wheeler highlighted a range of factors underpinning strong economic growth and dismissed soft inflation readings in the near term as largely reflective of the transitory impact of oil prices. Speaking directly to the benchmark lending rate, Wheeler projected “a period of stability” ahead. Still, the familiar refrainwarning that “future interest rate adjustments, either up or down, will depend on the emerging flow of economic data” was repeated. This makes for a news-sensitive environment going forward as markets attempt to divine the central bank’s likely trajectory alongside policymakers themselves. With that in mind, all eyes will be on the fourth-quarter GDP data set in the week ahead. Output is expected to increase by 0.8 percent, an outcome in line with the trend average. On balance, that means a print in line with expectations is unlikely to drive a meaningful re-pricing of policy bets and thereby have little impact on the Kiwi. New Zealand economic data outcomes have increasingly underperformed relative to consensus forecast since January however. That suggests analysts are over-estimating the economy’s momentum, opening the door for a downside surprise. In this scenario, building interest rate hike speculation may push the currency downward. The external landscape is likewise a factor. A significant correlation between NZDUSD and the S&P 500 (0.52 on 20-day percent change studies) hints the currency is sensitive to broad-based sentiment trends. That will come into play as the Federal Reserve delivers the outcome of the FOMC policy meeting, this time accompanying the statement with an updated set of economic forecasts and a press conference from Chair Janet Yellen. Fed tightening fears have proven to be a potent catalyst for risk aversion since the beginning of the month. That means a hawkish tone is likely to sink the Kiwi, while a dovish one may offer the currency a lift. Gold prices are off for a second consecutive week as the commodity rout continued with the precious metal off by more than 1% to trade at 1155 ahead of the New York close on Friday. The losses come amid ongoing strength in the greenback as the EURUSD drifted deeper into 12year lows. However with prices now coming into a key area of technical support and major event risk on tap next week, the short-side of the trade may be at risk near-term. Disappointing US retail sales data this week cooled the dollar’s rally temporarily as the weaker print dampened the argument that lower energy prices would drive more consumer spending. Still, the Fed remains on course to raise rates later this year as the labor market recovery continues to approach maximum employment and although inflation remains subdued, the central bank expects “transitory” factors to subside in the medium-term. 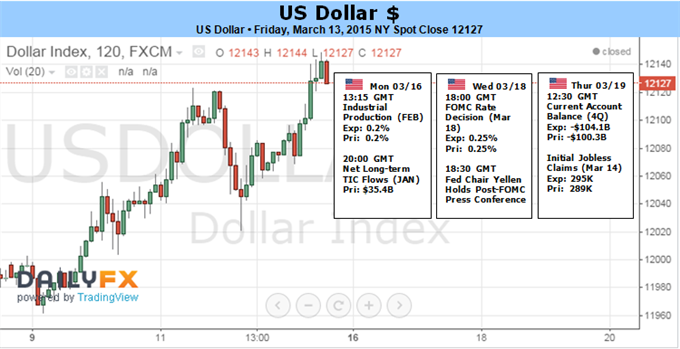 Look for the dollar to maintain its footing as higher interest rate expectations continue fuel demand with gold to remain under pressure amid weak inflation and strength in the greenback. The FOMC policy meeting next week will be central focus for markets with Chair Janet Yellen and company releasing the updated quarterly projections on growth, inflation and employment. The subsequent press conference will be of particular interest as market participants attempt to ascertain the Feds timeline for normalizing monetary policy. A more cautionary stance could offer a reprieve to the recent sell-off in bullion which will open next week just above a critical support zone. Last week we noted, “bottom line: looking lower while below Friday’s highs with support expected into 1150.” From a technical standpoint, gold ended a 9-day losing streak on Friday, the longest in nearly 40years and leaves the precious metal just above a critical region of support defined by longer-term Fibonacci relationships as well as the 2014 lows at 1150. This support zone is backed by 1137. A break below this threshold risks sharper losses for bullion with subsequent support objectives seen at 1125/30, 1099 & the 2010 low at 1044. Interim resistance stands at 1172/73 and this level will serve as our near-term bearish invalidation level with a breach above targeting trendline resistance off the January highs which converges on a basic 23.6% retracement of the yearly range at 1185 heading into mid-next week. Bottom line: its downtrend at support- with major even risk next week likely to offer a catalyst for price action on either a recovery back into the yearly trendline, or a continuation of the broader primary downtrend. The Nikkei had a very positive week over the last five sessions, pulling back to the ¥18,500 level. By doing so, we found enough buyers to turn things back around and form a positive candle. With that being the case, the market looks like it’s ready to go to the ¥20,000 level, which of course has been our longer-term target yet again. We believe the pullbacks continue to offer value, and that ultimately we will go even higher than the ¥20,000 level. The ¥18,000 level below that is massively supportive, as it was once resistive. We are not interested in selling this market until we break down way below there. We do not see that happening anytime soon, so we will simply stay on the sidelines if we pullback, which of course offers a bit of support at various levels below. We think that the buyers will look to take advantage of the liquidity offered by the Bank of Japan going forward, and will do so in the form of buying Japanese stocks. The Japanese yen has been looming large in the equation lately, and as it loses value, it’s very likely that the Nikkei will continue to respond positively to doing so. We believe that the Nikkei will not only a ¥20,000, but probably levels well be on that given enough time. We believe this is more or less a long-term buy-and-hold type situation, and with that we are essentially in the “buy only” camp. We have no scenario in which we are willing to sell the Nikkei as long as we are above at least ¥18,000, and probably even ¥17,000. If we break down below there, then of course a lot of things have changed, but ultimately it would take a significant amount of change in the attitude of the market to have that happen at this point in time. With that, we are bullish and remain so for the foreseeable future as we can’t even seem to hang onto losses for any real length of time at this point. The DAX broke higher during the course of the week, as we cleared to fresh new highs. That being the case, the DAX will offer buying opportunities every time it pulls back, and that’s exactly how we are going to approach this market. We believe that there is massive support below for this market, which of course will offer plenty of buying opportunities below. Ultimately though, we believe that looking for value as the best way to play this marketplace. We are overbought, so being patient will be necessary for those of you who are not already long. The NASDAQ as you can see fell hard during the course of the week, as the 5000 level offered enough resistance the previous week. Ultimately, we feel that the market should continue to find support though at lower levels. As you can see on the chart, the 4800 level was previous resistance, so it should now be support. If we can get some type of supportive candle, we would be a buyer in that general vicinity, and would also buy supportive candles all the way down to the 4600 level. The S&P 500 broke down during the course of the week, as you can see on the chart. However, we think that the real support is closer to the 2000 level, so having said that we are bearish for the short-term but recognize that longer-term traders will have the ability to buy supportive candles below. Those supportive candles will give us an opportunity to take advantage of the longer-term uptrend, which of course has been very steady over the last several months. We have no interest whatsoever in selling this market.